Each year, we hold an Invitation Design Contest and invite our customers to submit their favorite designs. We’re always amazed by the beautiful work of DIY brides and professional designers alike! This year we received more entries than ever! Take a look at the 2017 top three DIY winners, and find out which Cards & Pockets materials were used to create their invitation masterpieces. 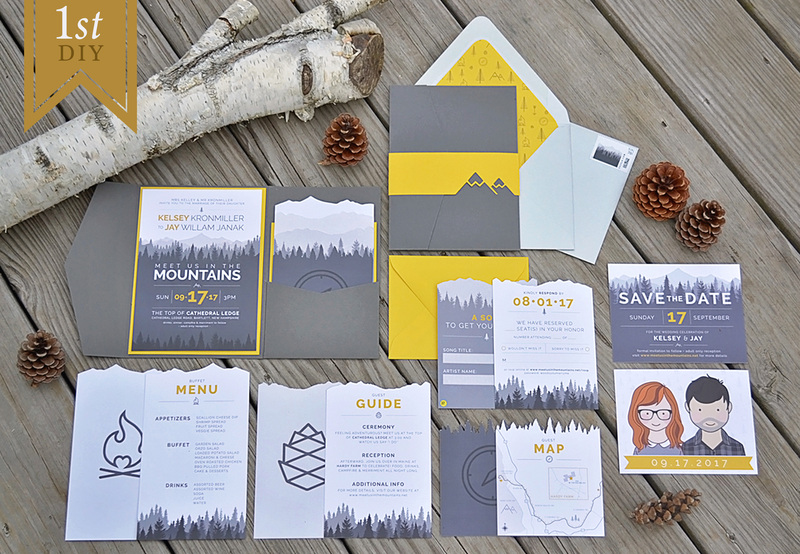 Kelsey’s DIY wedding invitations are modern, clean, and full of carefully crafted details that are so fun to look at! 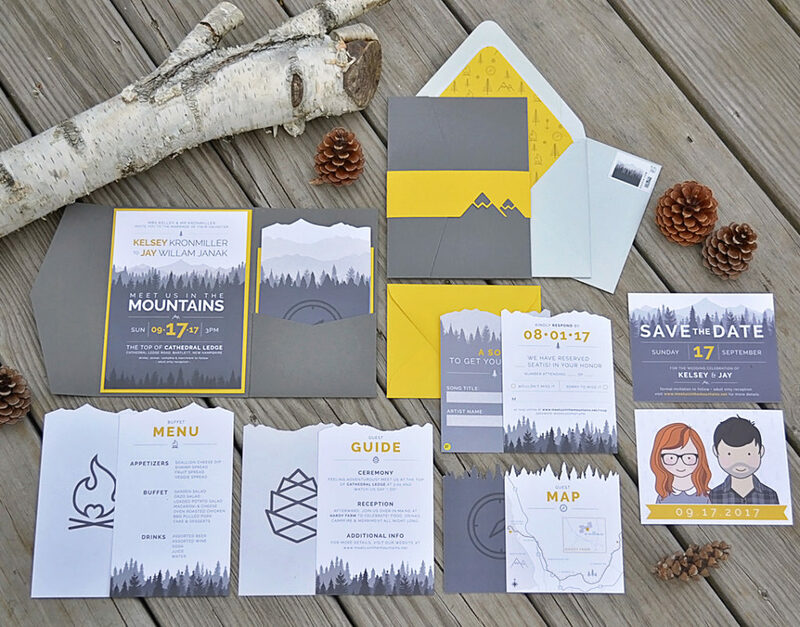 The gray and yellow color palette, playful iconography, mountain motif, and die cut inserts all wrapped up in a pocket make for one impressive suite. 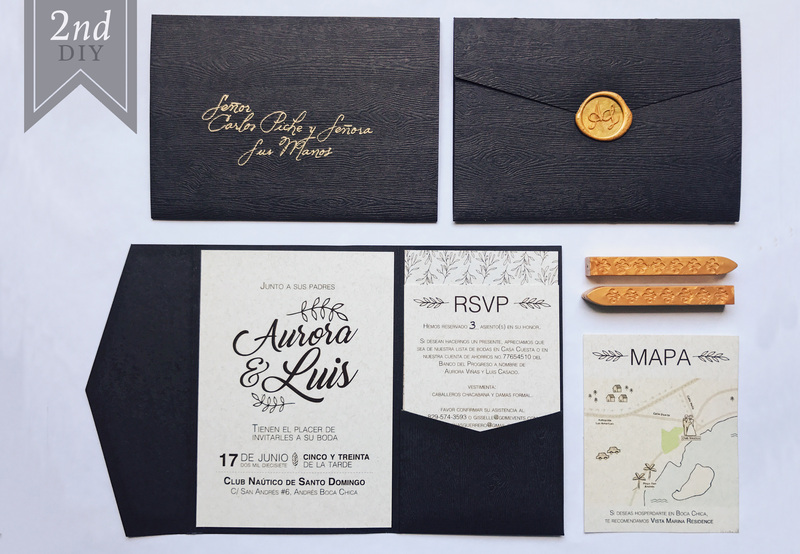 Sophisticated and simple, Aurora’s DIY pocket invitation combines repeating leaf illustrations, a modern script font, custom map, and hand lettering in gold. A Bubinga wood grain pocket adds texture to the suite, closed with an wax seal for an elegant finishing touch. We love all the pretty little details! Aurora says “The invitation was made with love for my wedding”. 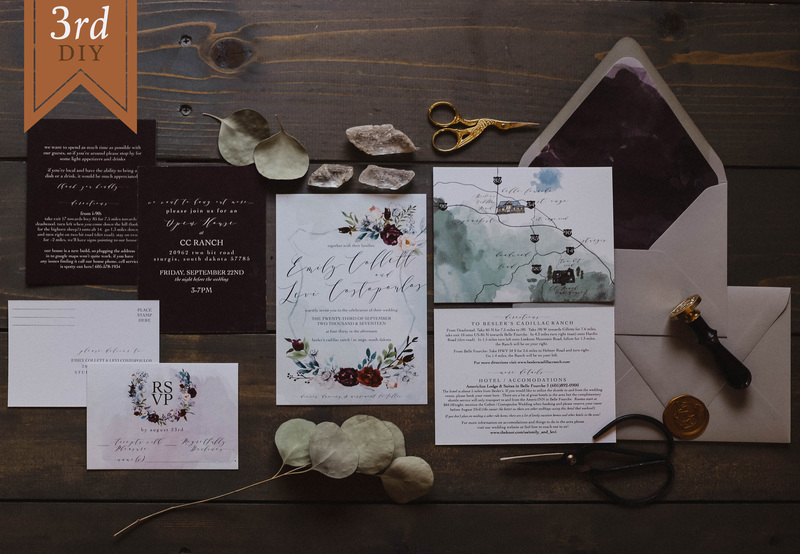 Emily’s DIY wedding invitations are elegant, moody, and beautiful. We’re loving all of the hand painted details like the floral crest, custom map, and the watercolor washed envelope liner. The deep colors are balanced out with a light gray envelope and gold wax seal to create one stunning suite for a fall wedding. Congratulations to our 2017 DIY Design Contest winners! We run our invitation design contest every fall for our customers. If you want to know when the next one will start, be sure to sign up for our newsletter to stay up to date. Join the Cards & Pockets mailing list!